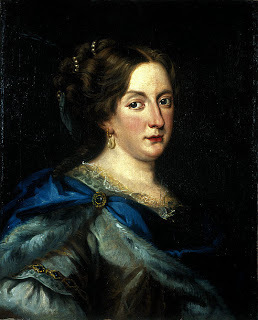 Born December 18, 1626 to King Gustav II Adolf of Sweden and Queen Maria Eleonora, Princess of Brandenburg, Christina was the only child of the couple to survive infancy. On the express wish of the king Christina received the full education of a prince destined to rule as was common for boys in her time. She therefore was instructed in politics, history, philosophy, Christian religion, and Islam. She read Greek and Latin and was fluent in French and Italian. She was an excellent horse woman, and she fenced and shot like a man. Through pillage, her father had collected a vast library and the beginnings of an art collection. She continued these hobbies in a more conventional way. Christina was five when her father King Gustav II Adolf died and her mother Queen Maria Eleonora was put under house arrest and exiled to castle Gripshom. Her Aunt on her father’s side, the Countess Palatine Katharina of Zweibrücken-Kleeburg raised her. At 16, she declined to co-rule with a regency council then took full control at 18 when coming of age. Christina took over the government, terminated the regency, and kept Count Oxenstierna as chancellor. There had never been a Queen regnant in the history of Sweden. She was therefore expected to marry and then abdicate in favor of her husband. Only when she had made it abundantly clear by declining offers in marriage from all over Europe that she really intended to take the crown as king did the coronation go ahead. In 1650, Christina was crowned as King of Sweden - not Queen. The disastrous spending spree of first her father, Count Oxenstierna and herself had left Sweden virtually destitute. She was forced to give away scores of noble titles to faithful retainers for their support. Therefore, during her reign, titled families doubled from 300 to 600 and when the chance came in 1648 to end the thirty year war she was prepared and willing to end it at all cost. An assiduous politician, Christina was able to keep the bitter class rivalries that broke out after the Thirty Years’ War from lapsing into civil war but was unable to solve the desperate financial problems caused by the long years of fighting. Before it’s end she managed to acquire Bremen, Velden and parts of Pomerania for Sweden in the peace treaties of Westphalia becoming Duchess of Bremen and Princess of Velden. Christina issued an edict for Bremen and Velden prohibiting the prosecution of witches. She left little doubt in the wording of her edict that she considered the prosecuting magistrates crazy; she even coined the expression ‘witch-craze’ in the sense we use it today. Christina’s abdication on June 6, 1654, after 10 years of rule shocked and confused the Christian world. The reasons, however, are unclear and still disputed. Immediately after the abdication, Christina changed into men’s garb, took on the title of Count Dohna, and rode off into the sunset. Her plan to travel through Danish territory to reach Antwerp had caused her to travel incognito disguised as a male noble. Having taken Gotland and Ösel from Denmark and Jämtland and Härjedalen from Norway, she doubted she would receive a hero’s welcome from King Christian IV of Denmark and Norway. In Antwerp, Christina was seen by dynasties in Spain and the Holy Roman Empire as the ideal mediator between Catholic and Protestant Electors in the Empire. But the French immediately questioned her neutrality in the Franco-Spanish War because she was residing in Spanish territory. They suspected that her abdication had been instigated by the Spanish Court in offering her the regency in the Netherlands or the Royal crown of Naples so they went on the attack by issuing and distributing defamatory pamphlets about Christina. Christina preceded from Antwerp to Brussels where she converted to Catholicism on Christmas Eve 1654. The ceremony was held in secret as the Habsburg still held out hopes for her mediation which would have been compromised by her conversion. In Brussels, her personal spleens and eccentricities played havoc with Spanish and French court protocols alike. She soon decided to head for Rome where she was welcomed by Pope Alexander VII with all the honors due a reigning queen. The Pope demanded that she should adopt the names Alexandra Maria on her confirmation ceremony conducted by Alexander VII personally. She happened to dislike Maria and signed her confirmation document with Christina Alexandra instead. She settled down in Rome where she was addressed as Queen of Sweden. One of the wittiest and most learned women of her age, Christina is best remembered for her lavish sponsorship of the arts and her influence on European culture. Her court became a center for artists and intellectuals giving her the chance to further her studies and broaden her horizon. She moved into the Vatican then the Palazzo Farnese owned by Duke Ranuccio II of Parma and Piacenza and resided there until she bought the Palazzo Corsini from the Sforza family. While in Rome, Christina got Alexander VII's successor Clement X to sign an edict forbidding Romans to chase Jews through the streets during carnival week. When she found that the Jews in Rome were unduly harassed by the Roman population, she coolly published an edict of her own declaring all Jews as living under her personal protection. The edict was signed simply ‘La Regina’ (The Queen). When Louis XIV renounced the Edict of Nantes, she wrote him a furious letter and publicly accused him of acting like a criminal. Christina lived to become one of the most influential figures of her time, the friend of four popes, and a munificent patroness of the arts. She could hold her own in the political arena when women couldn’t even vote. While not one to fit the traditional criteria of the era (she preferred to dress in clothes more typical of a man She was educated in the manner typical of men and was suspected of being a lesbian or transsexual) she was indeed a Women of Worth ahead of her time. Christina died April 19, 1689 of pneumonia. Against her expressed personal wish, her funeral was a grand affair. Her body was embalmed and lay in state for four days at the Palazzo Corsini. She was then brought in procession to St. Peter where she was buried in the crypt of the Popes. Pope Innocent XII ordered a marble bust in her likeness to be displayed inside the cathedral. Both tomb and memorial can still be visited today.